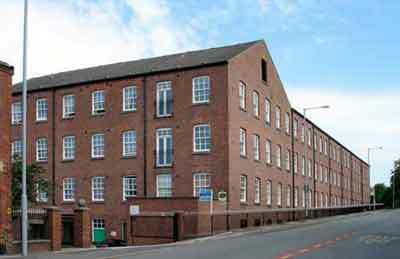 Mill owner Thomas Ashton Sr (1775/6-1845) was the founder of the textile industry in Hyde. He was responsible for creating one of the largest and longest-lived textile companies and it was based in Flowery Field, Hyde. When he died in 1845, he left the business to his two sons, Samuel Ashton (7 Nov 1804-April 1860) and Thomas Ashton Jr (1818-1898), along with the majority of his personal estate and property, which was worth just under £60,000. In 1854 Samuel and Thomas formed Ashton Brothers & Company out of their father's business, maintaining its position of one of the largest independent employers in Hyde until its sale to Courtaulds in 1968. The Ashton family founded several cotton mills in the area, including Apethorn and Woodley Mills, both of which lay beside the Lower Peak Forest Canal. As well as their interest in textiles they established a calico printing works and they also had coal interests. Woodley Mill, 5 August 2007. Built by Samuel Ashton in 1828. The brothers were especially noted for running cotton mills that did both spinning and weaving and this proved to be a successful venture when most mills specialised in either spinning or weaving but not both. Management of the family business then passed to Thomas Gair Ashton, 1st Baron Ashton of Hyde JP DL (5 February 1855-1 May 1933). He was the son of Thomas Ashton Jr and Elizabeth Gair and he was born in Fallowfield, Manchester. He married Eva Margaret James in the St George Hanover Square Registration District in 1886 and he was raised to the peerage on the 28 June 1911. In addition to his expertise as an industrialist, he was also a philanthropist and Liberal politician. 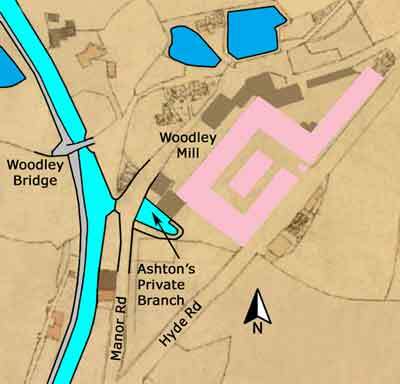 Ashton's Private Branch was situated just beyond Woodley Bridge (Bridge 12), by Woodley Wharf and a short distance to the north of Butterhouse Green Tunnel. It is no longer extant but the surviving part of Woodley Mill has been converted into apartments and it is now a Grade II listed building (List Entry No. 1319640, date first listed 17 May 1990). The branch canal would have been used to receive raw cotton from Manchester and coal from the two Woodley Coal Basins, both of which were owned by Samuel Ashton. It is also possible that finished cloth would have been carried into Manchester from here. This hall is a situated a short distance to the north east of Woodley Mill on Stockport Road, Werneth, Hyde. It originally belonged to another branch of the Ashton family and it was built in c.1820 by Samuel Ashton (1773-1849). In 1861 Benjamin Ashton (1813-1889), the third son of Samuel Ashton was resident there. This hall is Grade II listed, List Entry No. 1356445, date first listed 6 Feb 1986.